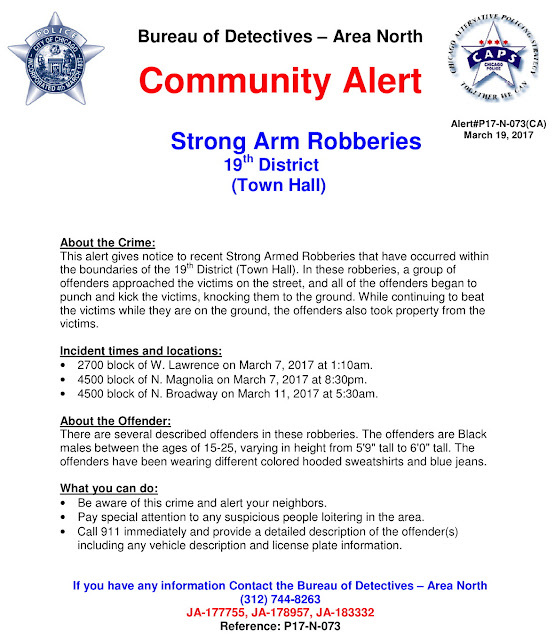 A string of violent robberies involving groups of attackers in Uptown and Lincoln Square is the topic of Area North detectives’ latest community alert. According to investigators, several offenders are beating people to the ground with kicks and punches. Some of the robbers take the victims’ valuables while others continue beating the victims while they are down, the alert said. Two victims were attacked on March 7: one in the 2700 block of West Lawrence at 1:10 a.m. and the other in the 4500 block of North Magnolia at 8:30 p.m. The third victim was jumped at 5:30 a.m. on March 11 in the 4500 block of North Broadway. Police said the offenders are black males between 15- and 25-years-old. They range from 5’9” to 6-feet in height, and all have been wearing different colored hooded sweatshirts and blue jeans.